available, that have been developed for the primary purpose of calligraphy. On a traditional basis, R & K inks are produced with modern raw materials. convertible pens particularly attractive. The convertible pen features a separate tank with a piston-filler. On most writing surfaces (including paper) R & K ink adheres well and, according to its capillarity, quick. Each of the Rohrer & Klingner inks are treated with high quality, pleasant dyes, that feature both a high brilliance and a well-balanced intensity. The colors of the iron gall inks intensifies when it oxidizes on the air; Hence, writings with those inks are considered permanent, the historical term being “archivally safe”. I’m not the biggest fan of reddish inks, so the first time I tried this ink I did not like it. I’ve since warmed up to it quite a bit. As with all reds in my ink collection, this one is destined for use as a grading, marginalia, and editing ink. I just can’t see red any other way. As a grading ink I’d say this one is pretty good. It’s not overly bright, but stands out in a sea of black. The only problem is that it can be washed away with ease. I’m not sure I’ve ever tried a color like this. There’s something vaguely orange about it, but not enough to really call it a red-orange. 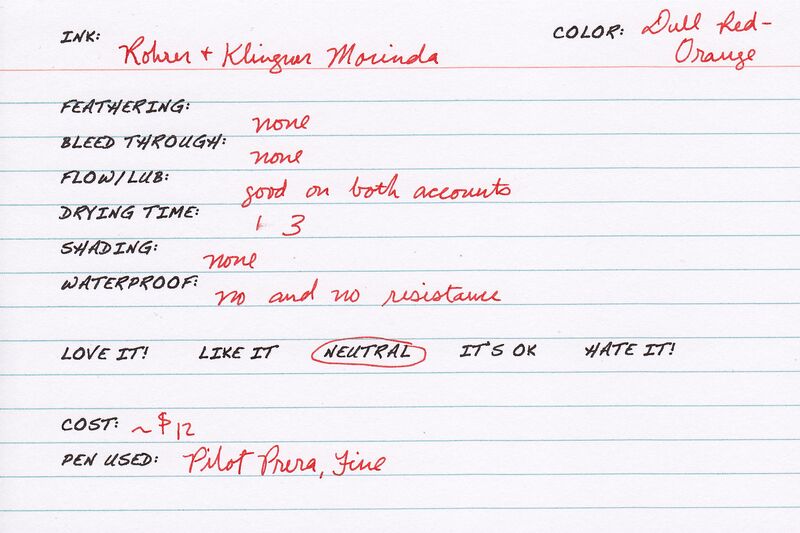 Perhaps it can be described as a lighter redder duskier version of Diamine Monaco Red? Or a duskier darker version of Iroshizuku Fuyu-Gaki? Saturation is average to medium high. Not waterproof or water resistant. Washed dead away. This ink sample was sent to my for review by Ryan at Pear Tree Pens. I am not otherwise affiliated with them.